This entry was posted in San Diego Events and tagged concerts, coronado, east county, live, music, north county, outdoor, summer by Alison. Bookmark the permalink. 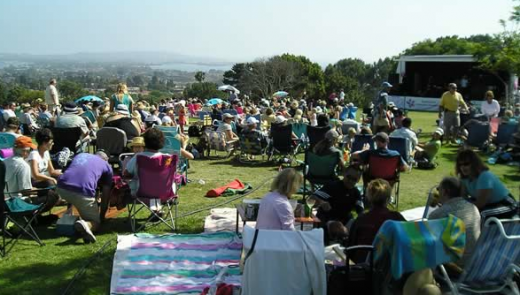 Poway Summer Concert Series is a free Event held every Sunday, located at Lake Poway and,alternately at Old Poway Park. Show time for all is 5:30pm to 7pm. There are mostly tribute bands from different genre’s of music scheduled to perform. Seating is very accessible– Events going thru August 12. Acoustic Blue, featuring members of Liquid Blue (www.liquid-blue.com) will be performing from 2 pm – 4 pm on Sunday, July 1, 2012 in the Big Lots parking lot located at 333 N El Camino Real, Encinitas, CA 92024 to promote Chela Gala Charity Productions, Inc. and their upcoming Lila Fest musical festival. Lila Fest will be held on August 11, 2012 (https://www.lilafest.org/viewFlyer.aspx). The Acoustic Blue performance is free, and tickets to Lila Fest will be available at a special rate. Wow a free concert! just by looking at the image i see that the people are excited and having fun. who performed at this concert? I think it was the Blue Breeze Band. Solana Beach should be starting their concerts soon at Fletcher Cove. I think they’re every Thursday. your name is the same as jimmy smits character on the old NYPD blue tv series….